The TimeCutter SS3216 features a 32", deep dome, top discharge deck design with convenient washout port. And has a 452cc Toro Hydrostatic engine. The Smart Speed® control system gives you greater control of speed and maneuverability. Shift to Mow & Tow for a higher speed range to cut large, open areas quickly or to drive from one end of your yard to the other. Shift to Trim & Tow for a slower speed range with more precise control for trimming around delicate areas or for properly pulling attachments. Dual Hydrostatic Drive System: Independent hydrostatic drive systems provide responsive maneuverability and zero turning capabilities. These independent drives are anchored to Toro's unibody frame and strengthened with a 3/4" (1.9 cm) diameter cross-bar for lasting durability and performance. 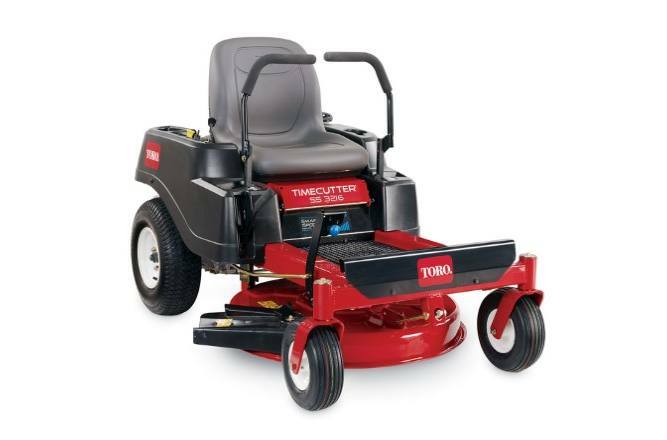 Heavy Duty Unibody Steel Frame: The unibody steel frame provides the optimal balance in rigidity and flexibility for quick, highly maneuverable mowing conditions. Hitch Kit: The easy to attach hitch kit allows you to increase the functionality of your zero turn mower by allowing you to pull light duty attachments. Recycler Kit: Cut more grass in less time and improve the health of your lawn.Toro’s innovative Recycler mulching system minces grass clippings into fine particles and puts them back into your lawn giving you a healthy, lush looking yard. The gross horsepower of this engine was laboratory rated at 3600 rpm by the engine manufacturer in accordance with SAE J1940 or SAE J2723. As configured to meet safety, emission and operating requirements, the actual horsepower on this class of mower will be significantly lower. See owner's manual for complete warranty details.